It’s cold. It’s wet. It’s windy. I am here in Indianapolis for my daughter’s college graduation. That’s tomorrow. For now I am hotel bound. We went to a movie theater last night with dinner service. Surprisingly the food wasn’t half bad. The movie was Guardians of the Galaxy 2. It was a CGI mashup of sarcasm, violence, and sci fi all set to a 70s soundtrack. Mindless entertainment for the mindless masses. 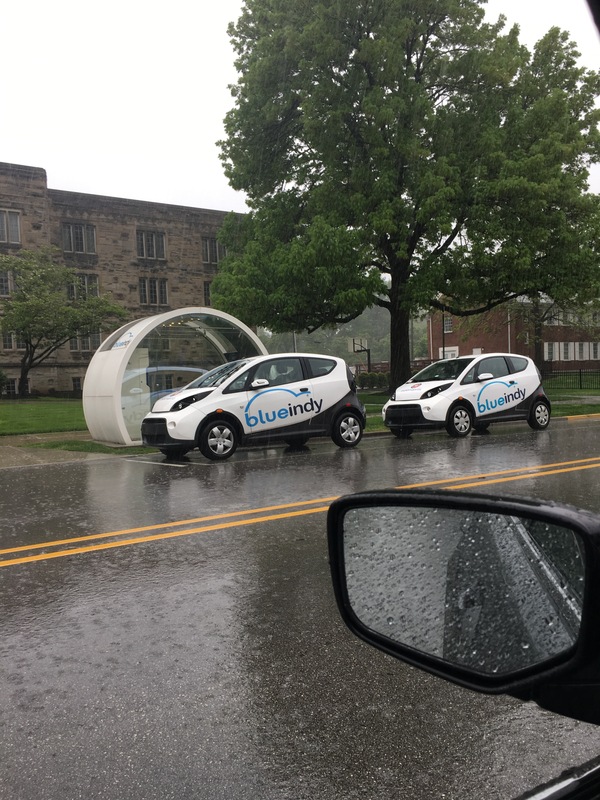 They have electric car share here. (Note the lovely weather.) My daughter says “nobody uses it.” Which is to say most people have their own cars. I notice that despite the fact that it is flat here nobody bikes here. What’s up with that? They do have some pretty slick bike infrastructure here. There are some very cool separated bike lanes downtown and the Monon rail trail. We are trying to figure out what to do here today that doesn’t involve standing in the cold rain. We’ve done most of the indoor stuff on prior visits. Bury me not on the lone prairie.,,..
Congratulations on your Daughters graduation, my girl will enter High School next fall so I have a few more years. As the youngest of 4 siblings once I graduated from Oregon State Univ. my parents were off to Retirement city post haste!